The purpins are usually laid on two back-to-back channels with a gap in the middle allow the rod to pass through. The sheet piling width of the gap must take into account the diameter of the tie rod and the thickness of the protective material on the the Tie rod. If the rod is tilted or needs to pass through at an angle Enclosed purlin then also need to consider additional spacing. Slot position of the decision. When the wall is located in the tide or the water level fluctuates, it can be prevented by the floating raft from being destroyed when the wall is arranged, and is also more econom. 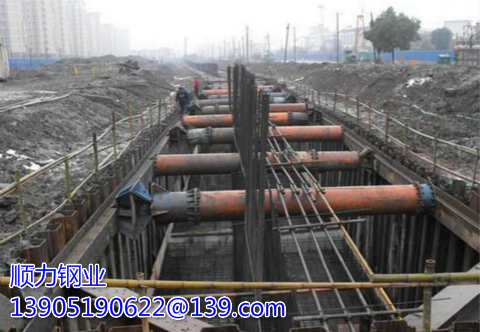 The position of the purlin splice shall be at a distance of 02775 Considering that the wall may be deformed during piling, the purlins should be 100 mm longer than the theoretical value. One end of each of the tie bars, as this is the nearest distance from the minimum bending moment on the purlin. Purlin is pre-drilled (if bolted) and the other end is not pre-drilled. And then on-site cutting and drilling. In this case, other measures must be taken to support the purlins, usually by brackets or welding: To avoid water accumulation on the purlins after backfilling, they should be at a lower position Set the drain, usually in the purlin web set every 3m. When using a sheet piling anchorage, it is also necessary to provide a purlin on the anchor pile, which should be placed behind the anchor pile to avoid the use of anchor bolts. Shun force of sheet piling manufacturers that if the purlin is a permanent Structure, in the delivery before the installation of protective coating to be installed after the completion of the scene can be further set up protective coating.